Al Capone sat in county jail from the time of his sentence in October until May of 1932. Capone’s lawyers had been granted a stay to keep the government from moving him to a federal prison until his appeals had been heard. On May 2nd, 1932, the Supreme Court ruled that Capone’s appeals had not reversed his fate. Two days later, Al Capone was moved to the Atlanta Federal Penitentiary. It was considered the toughest of the federal penitentiaries and was supposed to be Capone’s home for his full 10 year sentence. It didn’t take long for word to spread that Al Capone was getting special treatment in Atlanta. Despite denials by the warden, many inside the prison remembered Capone “living like a king” in Atlanta. The FBI investigated the claims and began to put a case together on behalf of J. Edgar Hoover. James V. Bennett, who became director of the Bureau of Prisons, later admitted that Capone had become “too big a problem for our officers at Atlanta to handle”. In the meantime, Alcatraz Island was being retrofitted into a high security prison. It was the intent of Roosevelt’s Attorney General, Homer S. Cummings, to include Capone as one of the first prisoners to be moved to Alcatraz. On August 18th, 1934, Capone was ushered out of the Atlanta Federal Penitentiary to what was then an uncertain destination to him. He had heard rumblings that he was destined for Alcatraz. By August 22nd, Capone found out he was going to be the first group of prisoners to be admitted into Alcatraz. The Justice Department and Warden Johnston had designed the prison to be unbreakable and referred to it as “The Rock”. Capone would not have the same accommodations as he enjoyed in Atlanta. Security was so tight at The Rock that Capone wasn’t even aware of what was happening on the outside. During his time in Alcatraz, Capone would begin to show signs of deterioration due to syphilis. Penicillin would not be used to treat syphilis until the 1940s, when it was too late to reverse the effects on Capone. There was one occasion when the authorities called Mae Capone believing that Al was nearing the end. However, shortly after Mae’s visit he returned to normal. Despite his apparent recovery, Capone would spend the rest of his time on Alcatraz Island under treatment in the prison hospital. After completing the federal portion of his sentence, he still needed to complete the 1 year misdemeanor portion of his sentence. On January 6th, 1939, Al Capone was released from Alcatraz and moved to Terminal Island in Los Angeles, California. Upon arrival, he was put in the jail hospital by the prison doctor. His doctor indicated that Capone was confused, irritable and depressed. His speech was slurred and his thoughts were, at times, incoherent. Like at Alcatraz, Capone would return to being completely lucid. The progress of tertiary syphilis was the reason for Capone’s inconsistent disposition. Only ten months into his misdemeanor sentence, Capone was being prepared for release. On November 13th, 1939, Al Capone was free from prison and ready for additional treatment. He was transported to the east coast for additional medical care. On November 16th, Capone was checked into Union Memorial Hospital in Baltimore by the federal authorities. Capone’s doctor wanted to admit him into John Hopkins, but the hospital refused to accept Capone based on his background. Union Memorial admitted Capone. He and his crew were allowed to take over the whole fifth floor. Capone was so worried about retaliation from his enemies, he even brought in a food taster to ensure he would not be poisoned. He would be treated at Union Memorial for the better part of four months, and would spend a few more weeks recuperating at the home of a Maryland State Police Sergeant in Mount Washington. 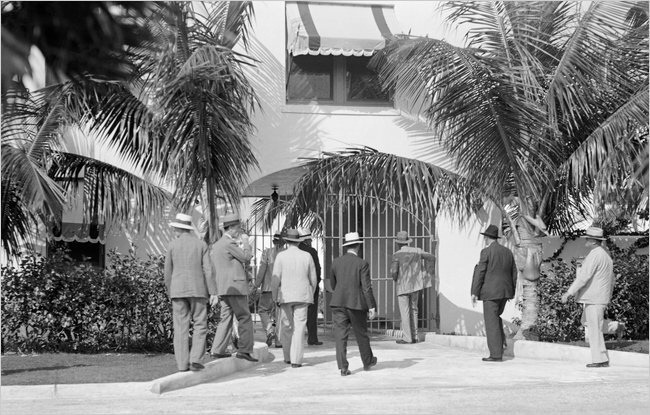 On March 19th, 1940, Capone would leave Maryland to return to his Palm Island home. 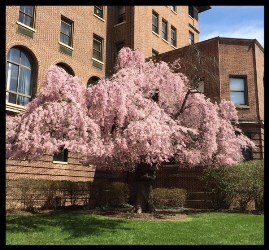 Capone was so appreciative of his treatment at Union Memorial that he donated two weeping cherry trees. One of the trees was removed in 1950 to make room for construction of a new wing. The other tree was split in half due to heavy snowfall in 2010. There are a number of cherry trees in the area that were descendants of the two trees that Capone donated. While the federal government had always wanted to get Capone for his violations of the Volstad Act, they lost their opportunity on February 16th, 1933 when the Senate voted to ratify the 21st Amendment. This amendment reversed the 18th amendment and put an end to prohibition. Capone was in the first year of his jail sentence. In 1934, the Town of Deerfield foreclosed on the peninsula, which was referred to as Capone Island, due to failure to pay back property taxes. The peninsula was turned over to the Florida Inland Navigation District and later turned into Deerfield Island Park. While the peninsula was referred to by the locals as “Capone Island”, it actually didn’t become an island until 1961. At that time, the Royal Palm Waterway (now the Royal Palm Canal), was dredged to connect the Intracoastal Waterway with the Hillsboro Canal. As soon as Capone began serving time for income tax evasion, the government quickly went to work to collect the fines and back taxes owed as part of the sentence. Although the amount would be negotiated down, Capone was served with a demand notice for $137,324 just after he was read his jail sentence. The Department of Internal Revenue conducted an 8 month investigation to determine that he had no discernable wealth to pursue to pay his obligation to the government. 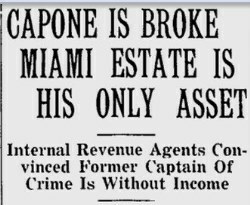 A December 22nd, 1938 Miami News article headline read “Capone is Broke, Miami Estate Is His Only Asset”. The article want on to say “Court costs, attorney fees and large income tax liens have used up all of Capone’s ready cash and forced him to put heavy encumbrances against the only real property he owns”. The property referred to in the article was his Palm Island home, which was in Mae Capone’s name. From behind bars, Capone signed over power of attorney to a Washington DC attorney for purpose of raising roughly $100,000 to satisfy the first income tax lien which the government placed against the Florida property. In a matter of time, more liens were placed on the property. Things got so critical that Capone considered hiring a ghost writer with the intention of selling his biography. On May 19th, 1939, Parker Henderson Jr. surfaced to once again make the news. 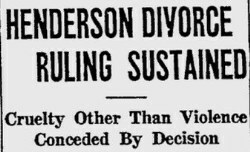 A Miami News story described Henderson’s claims of spousal abuse during a Florida Supreme Court ruling on his divorce case. Henderson alleged that “he had to go to a hospital shortly after his marriage and that his wife was irritable, used harsh words in speaking to him and made disparaging remarks to him about his family”. Parker Henderson Jr. seemed to have had the same luck in marriage as he had as a wannabe gangster. Capone’s life after prison declined into a very mundane routine. He returned to a home that would consist of Mae, Sonny and Mae’s brother, Daniel Coughlin, and his wife; all living in the Palm Island residence. Danny would become Al’s part-time chauffeur. Another of Mae’s sisters, Muriel, and her husband would also become residents of the Palm Island estate. Al Capone would often lounge around in his bathrobe and go fishing off his pier or play cards. Danny Coughlin would take him to the driving range to practice his swing. He and Mae would venture out to local restaurants for dinner. Almost no one would seem to notice. When Al would gain a bit of energy, he would lead a very tame expedition out to a local nightclub. His crew would quietly assemble at a back table, out of the high traffic areas of the club. Often times these expeditions would end quite early. On a few nights, Capone would throw a modest party on Palm Island. The party would feature drinks, hors d’oeuvres and a four piece band. The Capone household would cost about $40,000 a year to maintain. While Capone’s attorney continued to maintain that he had no assets the government could prove, the money to run the household just seemed to appear. Capone’s old outfit took care of him. While Sonny had some minor legal entanglements, he led a very straight life. He attended Saint Patrick’s School on Miami Beach and graduated in 1937. After graduating, Sonny went off to Notre Dame in an attempt to remain anonymous. He attended Notre Dame with his father’s alias last name of “Brown”. However, Sonny’s identity was revealed which prompted him to transfer to University of Miami where he studied Business Administration. On December 30th, 1941, Sonny married his high school sweetheart. Diana Ruth Casey was a good Irish girl like his mother. Diana was from an old Miami Beach family. Her father was the owner of Casey’s Oasis, a very popular bar at the time. A picture of Al Capone walking out of St. Patrick’s Church following the wedding ceremony was one of the last pictures of Capone looking like himself. He would live five plus years longer, but would have his good days and his bad days. At the beginning of 1942, Capone’s doctor, Dr. Joseph E. Moore, began to administer penicillin. While it was too late to reverse his condition, it did keep Capone from suffering from the more debilitating symptoms of syphilis. By this time, Dr. Moore described Al Capone having the mental capacity of a 12 year old. It was around this time that Capone’s old associates had nothing to do with him. 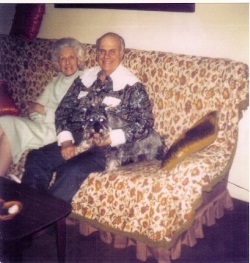 Jack Guzik described Capone as being “nutty as a cuckoo”. 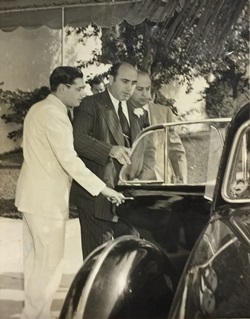 While the newspapers would link Capone’s name to any event connected to his old outfit, no one ever really believed Capone had any influence on his old syndicate. On Tuesday, January 21st, 1947, around four AM, Al Capone suffered what his doctors called an apoplectic stroke. The priest from St. Patrick’s Church rushed over to read his last rights. However, Capone wasn’t ready to go. After fourteen hours in a coma, Capone regained consciousness. Al was able to visit with Mae and Sonny. He appeared to be back on the right track, but his doctors knew that he wasn’t out of danger. As the week progressed, Capone continued to improve. However, just as his doctors were optimistic about a full recovery, Capone caught pneumonia on Friday, January 24th. His primary care physician, Dr. Phillips, called in a specialist, but both lungs were congested and his heart had gotten very weak. At 7:25pm on Saturday night, January 25th, Al Capone died from cardiac arrest. His family was at his bedside. His official cause of death was listed as bronchopneumonia on his death certificate. Al Capone’s body was brought back to Chicago and was laid to rest at Mount Olivet Cemetery on Chicago’s South Side. Al Capone had returned to where his legend had begun. Mae continued to own and live in 93 Palm Island until February 1st, 1952. She would sell the estate to a Cleveland Real Estate Broker named Thomas W. Miller. Miller would buy the estate and all the furnishings for a little over $64,000. Miller felt he got such a good deal that he claimed that he “just stole it”. He would live in the home for a few years and then swap it for an airport near Canton, Ohio. The house changed hands a couple of more times in the 1960s. In 1968, William Knowles bought the house for $48,000. In 1969, the home was sold to Roy Fowler for $50,000. Both owners got tired of all the unannounced visitors and onlookers trying to get a glimpse of the former mobster’s home. Henry Morrison, an airline pilot, bought the house in 1971. When Morrison bought the home, he was not aware that it was the former home of Al Capone. Morrison kept the home until it is sold to Peter Corsell, the founder of an energy company named Gridpoint, in 2011. Corsell renovated the house and sold it to a French buyer in 2013. In May of 2014, MB America purchased and refurbished the home. The home was renamed “93 Palm” and is now open as an exclusive photo and video productions venue. Sonny had worked a number of jobs during his adult life. He sold used cars, worked at the Port of Miami, a tire company and several other jobs. By 1956, he and Mae bought a restaurant called Ted’s Grotto at 6970 Collins Avenue. It was an Italian Restaurant. They ran the restaurant together for about 10 years according to research found at My Al Capone Museum. Sonny was always struggling with money, but conducted himself with integrity and pride for his family name. He refused to change his name for a job opportunity that would have provided him some financial stability. 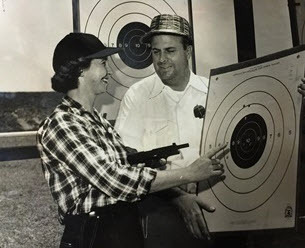 The Springfield Firearms Company offered Sonny $25,000 to tour the country to demonstrate their product line. They asked him to change his last name and he refused. When his wife left him and took his daughters out to California, Sonny did get crossed with the law for something minor. He was caught shoplifting at a Kwik Check in Miami Beach. The papers around the country had a field day with the story. However, the judge only put Al Capone’s son on probation for two years. When his probation ended, his probation officer stated that Sonny was “exemplary”. The attention following his arrest for shoplifting inspired Sonny to petition to change his last name. In 1966, Sonny changed his name to Albert Francis Brown. This name was one of his father’s frequently used aliases. Sonny left for California in the 1980s to spend more time with his daughters. On the other hand, Mae remained in Florida. It is unclear how she spent her time after she and Sonny got out of the restaurant business, but it is known that she spent her later years in the Hollywood Hills Retirement Home. She passed away on April 16th, 1986 at the retirement home. Sonny remained in California until his death. He died on July 8th, 2004, at the age of 85. He left his four daughters and numerous grandchildren and great grandchildren. While Sonny never found peace carrying the Capone last name, he did live a long and full life. Tequesta: “Judge Vincent Giblin – The Life and Times of a South Florida Attorney and Judge”, William G. Crawford Jr., Number LXX (2010). 2 Comments on "Al Capone in Miami – Part 4 of 4"
Such an amazing story, thank you for all of the time and effort you put into this! I appreciate “The Rest of the Story”; as I was raised up knowing that the doctor who treated Capone for sinus problems was the one my mother worked for on Miami Beach. She had some dealings with Capone and his son in the office. Her memories of Sonny Capone’s visits to the doctor were not good ones. He apparently did not behave well when he needed treatments and was not concerned with making a good impression at a young age.